Current and Emerging Technologies in Microbial Diagnostics, the latest volume in the Methods in Microbiology series, provides comprehensive, cutting-edge reviews of current and emerging technologies in the field of clinical microbiology. 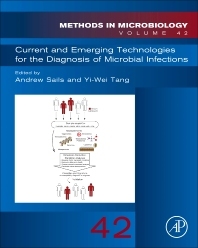 The book features a wide variety of state-of-the art methods and techniques for the diagnosis and management of microbial infections, with chapters authored by internationally renowned experts. This volume focuses on current techniques, such as MALDI-TOF mass spectroscopy and molecular diagnostics, along with newly emerging technologies such as host-based diagnostics and next generation sequencing. The audience for the volume includes pathologists and clinical microbiologists working in hospital laboratories, public health laboratories, national reference laboratories, academic and research microbiologists in universities, students studying clinical microbiology or biomedical science and industrial microbiologists working in the clinical diagnostic industry. Dr Andrew Sails is a Consultant Clinical Scientist at the Public Health England Microbiology Services Laboratory in Newcastle upon Tyne, where he is Head of Molecular Diagnostics and Research and Development. He graduated in Biology from Manchester University in 1991 and began his clinical microbiology career at Preston Public Health Laboratory. Further postgraduate study resulted in a Masters degree in Biomedical Science from Manchester Metropolitan University and a PhD in Medical Microbiology from the University of Central Lancashire. He carried out postdoctoral research the Centers for Disease Control and Prevention (CDC) in Atlanta, USA research into the development of DNA sequence-based subtyping of Campylobacter and other pathogenic foodborne bacteria. He returned to the UK in 2003 to take up his current post at Newcastle, where is Head of Molecular Diagnostics and leads the development and evaluation of new technology and methods for microbiological diagnosis, identification and typing of microbial pathogens. In 2004 he was awarded the W.H. Pierce Memorial Prize for outstanding contributions to bacteriology by The Society for Applied Microbiology. He has worked extensively in the area of molecular diagnostics and molecular epidemiology of infectious disease (M. tuberculosis, Campylobacter and C. difficile in particular) and has published in these areas. His current research interests include the detection and fingerprinting of pathogens and the application of molecular biology to clinical microbiology to aid the diagnosis and management of infectious disease. He has served on the editorial board of several journals including Applied and Environmental Microbiology, the Journal of Clinical Microbiology and the Open Microbiology Journal. He is a member of several learned societies including Society for Applied Microbiology, The Federation of Clinical Scientists, The Association of Clinical Biochemistry and Laboratory Medicine and is an affiliate member of the Royal College of Pathologists. Since 2005 he has been a member of The Society for Applied Microbiology Executive Committee and is currently serving as its Honorary Meetings Secretary. He was also recently appointed as a Visiting Fellow at Northumbria University where he is contributes to undergraduate and postgraduate teaching and PhD supervision. Dr. Yi-Wei Tang is currently the Chief of the Clinical Microbiology Service at the Memorial Sloan-Kettering Cancer Center and a Professor of Pathology and Laboratory Medicine at the Weill Medical College of Cornell University in New York City, USA. He obtained his medical training from Fudan University Shanghai School of Medicine and Ph.D. in microbiology and immunology from Vanderbilt University. He was a Lecturer and Clinical Fellow at the Mayo Clinic and Professor at the Vanderbilt University School of Medicine. He has been engaged in medical and molecular microbiology translational research, aimed at developing and evaluating new and advanced microbiological diagnostic testing procedures. Dr. Tang ranks among the top of the scientific field in clinical and molecular microbiology, as evidenced by his election as an Editor for the Journal of Clinical Microbiology, an Associate Editor for the Journal of Molecular Diagnostics, and a Fellow of the American Academy for Microbiology and of the Infectious Disease Society of America. Dr. Tang has been recognized for his extraordinary expertise in the molecular microbiology diagnosis and monitoring, with over 200 peer-reviewed articles and book chapters in this field during the past 20 years.